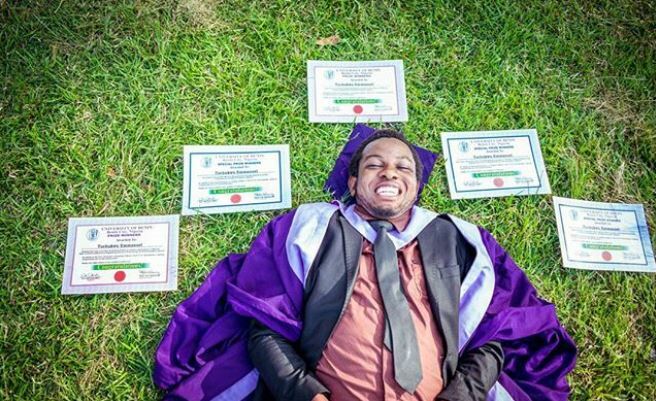 A Nigerian human rights activist, Fejiro Oliver has called on the Nigerian National Petroleum Corporation to intervene on the case of a genius Nigerian man, Tochuckwu Okafor who emerged as the Best Graduating Engineering Student of the University of Benin with a stunning 4.95CGPA. Best Graduating Student, University of Benin. - Dean's Prize to the Best Graduating Student in academic performance, Faculty of Engineering.‎ ‎- Department Prize to the Best Graduating Student, Department of Electrical/Electronic Engineering, Faculty of Engineering. - Nigerian Society of Engineers Prize to the Best Overall Graduating Student in the Faculty of Engineering. - Arch. Aminu Abubakar Prize to the Best Graduating Student in the Department of Electrical/Electronic Engineering, Faculty of Engineering. ‎- Nicholas and Victoria Osifo Memorial Scholarship to the Best Graduating Student in Engineering. He graduated with a stunning 4.95CGPA in almighty Engineering. Days after, Al-amin Bugaje from faraway â€ªAhmadu Bello University Zaria (ABU) was named overall best student with 4.93 CGPA from Electrical Engineering Department, Faculty of Engineering. He was IMMEDIATELY offered scholarship up to PhD, by the GMD of NNPC, Mr Maikantu Baru in any university of his choice in the world. Yet Tochukwu who graduated with a higher CGPA was ignored by the GMD. Both of them graduated in Electrical Engineering, so it can't be said that one merits it than the other. The money that will be used to send Al-Amin to the best university in the world will not come from the GMD private purse but NNPC. It is fraudulent and corrupt to send the Hausa graduate abroad while leaving the one with higher CGPA to remain with only B.Eng. It is totally unacceptable. I call on Nigerians to trend and see that justice is done to Tochukwu by NNPC. No one is a second class citizen in Nigeria even though a fulani man may be the one on the seat of power and another fulani man as NNPC boss. What is good for Al-Amin is good for Tochukwu."